Taken on Sha'ab Hassan, Egyptian Red Sea. Masked Puffer, Arothron diadematus (Rüppell). 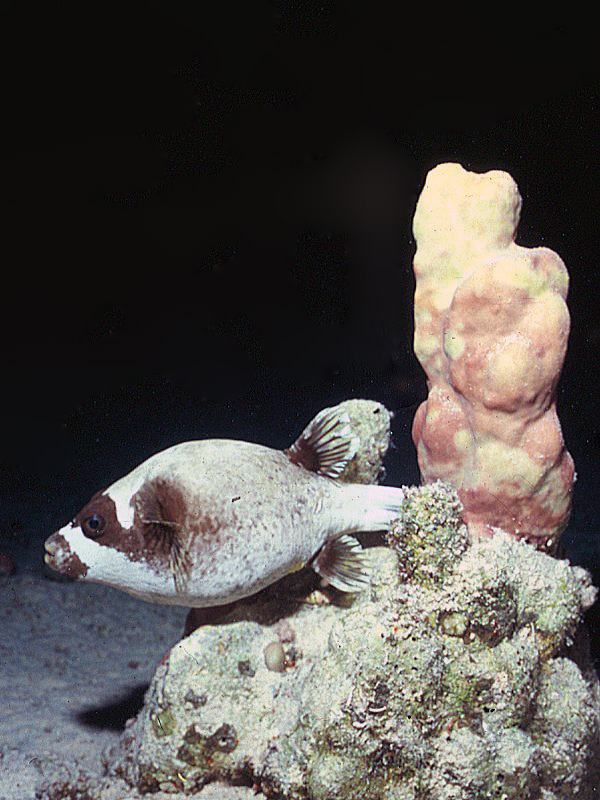 Distinctive looking, this small pufferfish has a black mask over its eyes reaching back to its pectoral fins, and a black mouth. It is common on fringing coral reefs in the Red Sea. Elsewhere it is replaced by Arothron nigropunctatus (the Blackspotted Puffer). However, some experts believe these to be the same species. Pufferfish are bulbous fishes with a scaleless, prickly, skin. Their mouths look pursed and are fused into a beak. They are called pufferfish because when threatened they greatly inflate themselves with water, making themselves look much larger than they usually are. This defence mechanism is important because they move so slowly through the water they would otherwise be easy pickings for predators. Their second line of defence is their toxicity. The Puffer is harmless, unless eaten. The liver, intestines, gonads and skin are highly poisonous and cause death in around 60% of people who eat it. If prepared properly the puffer (or fugu) is edible and considered a delicacy in Japan and Korea. The Puffer's toxin - tetrodotoxin - is produced within the pufferfish by bacteria. The fish aquire the bacteria by grazing on the reef and eating molluscs and other invertebrates. Weight-for-weight, tetrodotoxin is up to 100 times as deadly as the venom of the black widow spider and one of the most poisonous natural substances.